Every class to be written, is perfectly contained in one and only one layer. 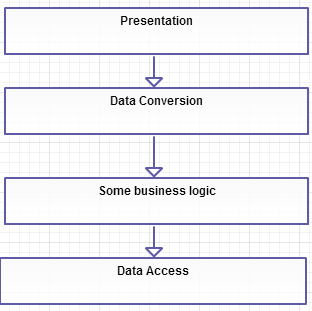 For example, the class UserDataConverter would probably be contained in layer “Data Conversion”; it has nothing to do with data access, for example, nor with displaying information. The situation, however, gets completely different when dealing with requirements that are all over the system – like transactions or logging, for example. These things are spread in an application. They are not tied to a specific layer, but rather to all of the layers. If you want transaction management, that will possibly impact all the layers from the top to the bottom; you can’t do it in the DAO level alone. A transaction may start with a click on the GUI, and propagate all the way down to the database – should anything go wrong at any level, the transaction rolls back. 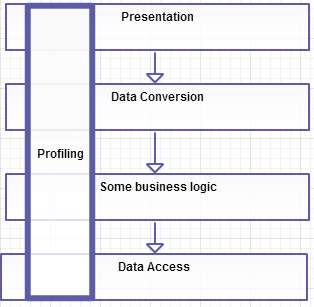 We cannot say that profiling should apply to business logic alone, as we may as well want to know how many time does it take to convert data between different formats. Now, a very bad solution to this problem would be getting the current time in the beginning and the end of every method we want to be profiled, and doing something with the result. This solution would create some awful spaghetti code with lot of duplication, not to mention the tedious work one should be doing for a large, legacy system with hundreds of methods to be profiled. A nicer option would be creating some kind of utility class, to which you could tell that the method has started executing, and has finished eventually. The utility would take care of computing the elapsed time and handling the resulting numbers. However, this would still be pretty tightly coupled, with two invocations per method. It may seem that we’ve now got rid most of the code multiplication, but those start/stop methods are still spread all around our code base. How do we clean up our code, then? Thank God, there is a way to handle this situation (and of course not only this one; it’s also suitable for error handling, self-* operations, customized access management, and almost any feature that spans through layers): using aspects (as we will see, aspects are also called interceptors in some frameworks). With the usage of aspects, this is slightly changed. The object on which the method is called, will be coated in a proxy object to which all the method calls will be routed. Whenever a method call is made to the proxy object, the call will be ‘hijacked’, and the proxy will be given a chance to perform different operations before, after or around (before+after) the method call. For this to work, you will need some kind of a container (either Spring or JavaEE can be a good choice) or third party library, as you cannot do this with Java right out of the box. 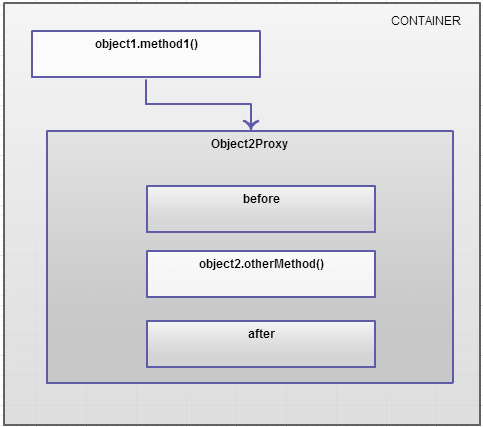 As you can see on the diagram above, the container directs the call of otherMethod to the proxy around object2, and performs some operations before and/or after the original method call. This way object2.otherMethod can always stay the same, the only things that change are the before and after methods, but as you are going to see, they are present at only one place within the whole system. The class that implements the logic for before and after is called the Aspect. All that remains, is to make the container notice our aspect, and tell it what methods to intercept. This is, nevertheless different for each and every container – see below for examples. Simple, elegant, 100% reusable and totally independent of the business logic (single responsibility principle for the win). As mentioned earlier, aspects are very useful when some application requirements would break the boundaries of different layers. In these cases it’s best to organize these features such a way they are easily accessible everywhere, without code duplication – through aspects. However, it’s a very bad practice to extract pieces of business logic into aspects. A poorly implemented aspect with surprising side effects can be the best place for bugs to hide. It is perfectly OK to implement an aspect to check whether a certain XML file is well formed or not, before starting to work with it, but do not send back a reject message to the client from the aspect if the validation fails. Throw an unchecked exception instead, and let business logic handle functional requirements like sending reply messages. Usually, using before or around aspects you can manipulate the parameters passed in to a method call; with after and around aspects you can modify the return values of the those methods intercepted. Even if it’s technically possible, (most of the times) it is not a good practice to do so. Again, figuring out that the system is throwing exceptions just because some aspect keeps changing the input parameters or the return values is, well, at least tedious and frustrating. Don’t overuse aspects. Although many times they come in handy, they can make debugging a nightmare. Not to mention that normally aspects will not run with the unit tests suite (as there is no container present to interpret them), so watch out for logic hiding in them. Test them as well as your regular business objects. As we know the theory by now, let’s apply this knowledge in practice. The code examples to follow are not meant to make you an aspects/interceptors expert, just to exemplify how the things mentioned above can be achieved with different containers. In the following, we are going to implement the profiling aspect using three different containers: Spring, EJB and CDI. In Spring, each method to be intercepted should be contained in a Spring bean (note that only managed beans will be intercepted, not those created with the new keyword), and the same is true for the caller method. You cannot intercept a method call on a non-Spring-bean. Notice the @Aspect annotation at the top of of the class. Don’t fall in a common trap here: in your config file, you still have to define this aspect as a bean; thus the @Aspect annotation alone is not enough. Also, in the config file (I am taking a stand on Java class based configuration) you have to enable AspectJ style proxying, using the @EnableAspectJAutoproxy annotation. Finally, don’t forget to call proceed() on the context object, so the program flow can advance. Pretty simple, huh? From now on, every method annotated with @Profiled will be intercepted by the container, provided that these annotations are placed on managed beans’ public methods. The container will not intercept private method calls. Don’t forget to put aspectjveawer.jar on your classpath. 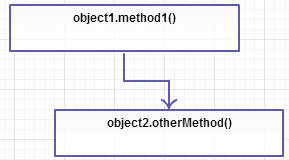 You can play around with the context object; you can even change what’s getting passed and returned from a method. (Aspects are called Interceptors in the enterprise world) In this case, the implementation for the profiler is somewhat easier. As this is JavaEE, you don’t have to place different kinds of jars on the classpath, as your container will have everything needed – right out of the box. Internal method calls (within the same bean) are not intercepted, no matter how the methods are annotated. In the case of CDI interceptors we need an intercepted bean, an interceptor, and an interceptor binding – which is just like in case of our Spring example, a custom annotation. To read more in depth about CDI interceptors, go to: http://docs.jboss.org/weld/reference/1.0.0/en-US/html/interceptors.html. Aspects can be a very efficient and clean means of decoupling business logic from omnipresent features. This way the business methods can deal with business requirements while aspects add the decorator functionality for handling common, non-layer specific tasks. Aspects are easy to get started with, as chances are high that larger systems are already based on either Spring or JavaEE. They both handle aspects (interceptors) very well, without writing complex code to enable them. Aspects over-usage can have a bad impact on the system, as it can become hard to track what feature is handled by what aspect. Also, take care not to implement features carrying business value as aspects.